This post has been sponsored by Korbel® California Champagne. All thoughts and opinions are our own. The Little Miss Party team hosts a holiday party every year, and we always try to outdo ourselves with the details and special touches for our guests. This year, our theme is sparkle and shine—and we’ve created the perfect signature cocktail to impress our guests. We’re calling it the Sparkle & Shine Spritzer, and this drink is certain to be the star of our party and all of our guests’ Instagram feeds! We ran to our local grocery store to grab some supplies and picked up our favorite Korbel® Brut because we know its light fruit flavor will mix perfectly with our sweet pink lemonade. With the addition of a rock candy and cotton candy garnish, this drink is the perfect festive glass for our guests to enjoy. Not only is it delicious but it’s gorgeous as well, and it totally inspired the color scheme for our party! As guests RSVP to our holiday party invitation, we add a small touch to let them know their safety and health through the holiday season is extremely important to us. As hosts, we make sure to send them a note confirming the party details and providing them with Korbel's special Uber discount code “KORBELHOLIDAY18EVENT.” Our guests deserve to be treated like the VIPs they are. This way, we can relax and enjoy the night knowing that everyone will make it home safe and sound. 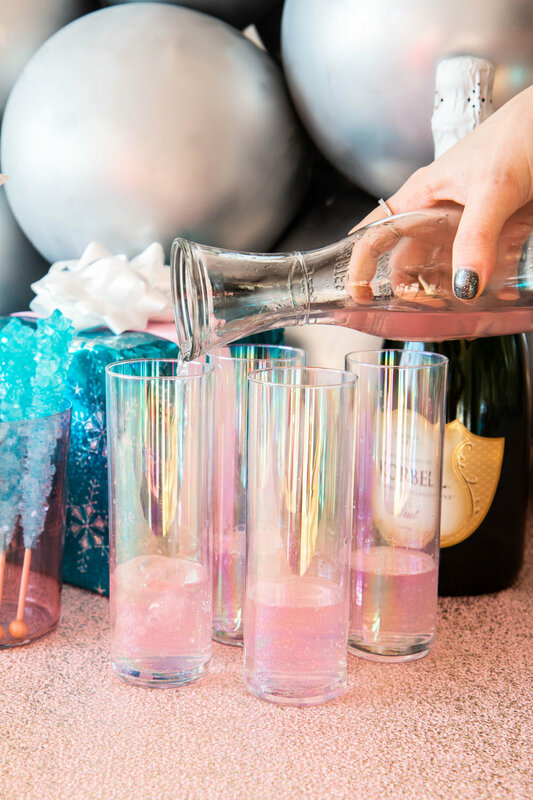 We started by pouring in pink lemonade, topping it with Korbel® Brut, and adding a touch of cotton candy into the liquid to let it dissolve and incorporate its sweet flavor. We garnished the glass with the stick of rock candy and more cotton candy on our favorite sparkly skewers so our guests can add more sweetness if they please! This is our absolute favorite time of the year, and we consider ourselves so lucky to be able to host our friends and family. With an easy and delicious signature drink planned, and knowing our guests are covered with rides home at the end of the evening, we are able to truly relax and enjoy the party! Celebrate Responsibly. ©2018 F. Korbel & Bros. All rights reserved. Intended for readers 21+.